Yamaha RX-V1067 review | What Hi-Fi? How many products do you own that have an HDMI output? A poll of staffers on the magazine revealed an average of three or four. We imagine that an HD set-top-box, Blu-ray player and one if not two games consoles are common in many homes. Well, Yamaha's RX-V1067 will handle your four, and raise you another four. That's right: eight inputs, all of which can handle a 3D signal. Not that we're complaining; the 'V1067 also has a brace of ARC-enabled HDMI outputs, an ethernet socket for internet radio and media streaming functionality. The back panel of the Yamaha looks pretty sorted, and the fascia doesn't look bad either. The minimalist slant is to be applauded – and you'll still find a smattering of buttons and USB and HDMI inputs behind the front panel. Unfortunately the same can't be said for the remote control. It's packed with tiny buttons, which makes it difficult to see what you're pressing. Where remotes are concerned, we tend to find that less is most definitely more. Yamaha's overlayed menus look good and keep you from missing any of the action, but in practice, they aren't as easy to negotiate as some rivals'. 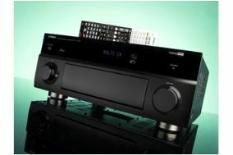 The ‘RX-V1067 uses technology from the company's impressive DSP-Z7 and DSP-Z11 home cinema amps, which include using a symmetrical power amp layout, and rigid bottom frames. The amp also has new components including a heat sink designed to reduce vibration and reduce the effects of temperature change. Well, the results are stunning. Yamahas have always had processing prowess, but the 'V1067 sets a new benchmark at this price. The ease with which you're dropped into a movie or concert is remarkable. Michael Jackson's This Is It is a case in point. Even during the soundcheck before Beat It, you get the feeling that you're really there, listening to a chat between Michael and the director. When the tune kicks in you feel like you're experiencing the concert first hand. The Yamaha times superbly well and peels back the layers of the track to reveal exceptional detail. Switch to the DTS-HD Master Audio soundtrack of Robin Hood and the Yamaha brings the battles right into your living room. As Sir Robert Loxley and his men are ambushed in the forest, the Yamaha launches into action: arrows soar with amazing fluidity between channels, while high frequencies sound crisp and detailed every time swords are crossed. Low frequencies show weight but there's lots of subtlety, too. Video processing is on a par with the Denon AVR-2311, while CD playback sounds dynamic and tracks keep good time. Vocals are detailed and expressive, although the Onkyo has a marginally more focused and precise sound stage. If you want a fulfilling cinematic experience, the RX-V1067 won't disappoint: a fully justified five stars.